Cutting, and Filing an Anxious Dog's Nails. Poor Ziva hates having her toes messed with...she'll shake your hand with her paw but please, "Leave the toes alone!" When we first adopted Ziva she had terribly long almost talon-like nails, way too long for any dog and they were starting to curl. We know from the rescue that she was a semi-social puppy found abandoned in California at an industrial work site, our guess is that no one ever bothered to cut her nails - not even the rescue. Ziva's story HERE. To get Ziva used to having her feet handled, we taught her to "shake" with her paws, and we would massage her feet and play gently with her toes and nails regularly without trying to clip or file when we were all snuggling on the couch during movies, or any other chance we got. We also began to paint her nails to help desensitize her to having her feet handled. I wish we had a picture of how bad her nails were when we adopted her. 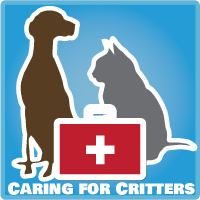 According to the ASPCA, it's important to maintain and trim your dogs nails regularly because they "can break, which is very painful and sometimes results in infection. Long nails can also cause an irregular gait that can lead to skeletal damage." Posture/Balance - Normally when a dog stands they are on the pads of their feet and their weight is evenly balanced. But when a dogs nails are too long, they stand a little bit back on their feet because their nails are touching the ground first. Can Cause Splayed Toes & Interfere with traction. Long Nails Can Catch, Potentially Snag, and then Break or Rip. Ziva's broken nail has taken almost a month to heal. How Did She Break Her Nail? And What To Do When your Dog Breaks a Nail. The Nails can rub in-between your dog's toes and cause blisters. - This was a major problem that Ziva had when we first got her. If we went on a long walk, she would start limping because she would develop a blister which would then break and bleed. Not only does this hurt but it can take a long time to re-heal due to nail length, and you again have to worry about infection issues. Sports - When your dog is running up or down an obstacle and their nails are too long it feels like you if you were to wear short shoes with long nails, your nails end up jamming into the end of your toes - same concept with a dog, their nails end up jamming back into their nails beds causing extra sensitivity. Senior Dog Care - You can fix their bad/hunching posture, and balance by keeping their nails trimmed. This is important for your senior dogs to help prevent stumbling and falling. 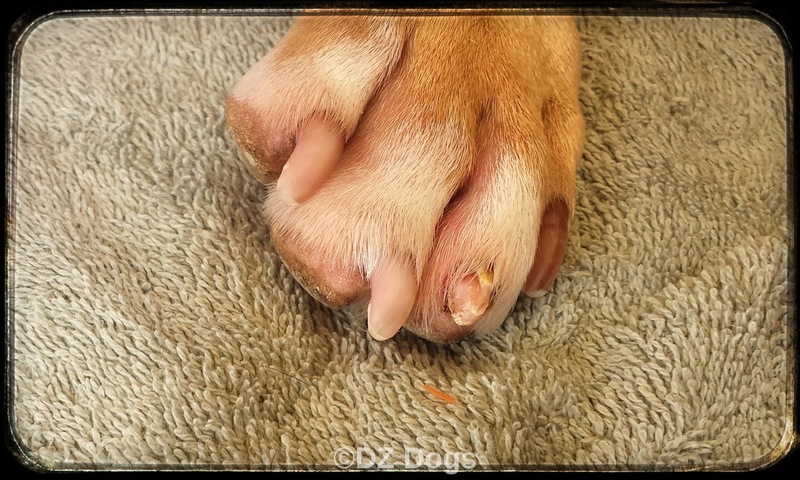 Dr. Leslie Woodcock DVM - "Nails should not be touching the ground when your dog is running around. Nails are for when you are in grass, or sand and you are running - their purpose is traction." - Owner's excuse of "myself/groomer/vet nicked their quick one time." Your dog can get over it, can you? Being nervous about handling their feet for example - fear of doing it again - makes the dog not want YOU to handle their feet because you are giving off nervous/worried body language/emotions. If you have a very active dog they many not need much trimming. Most dogs can wear down their own nails. 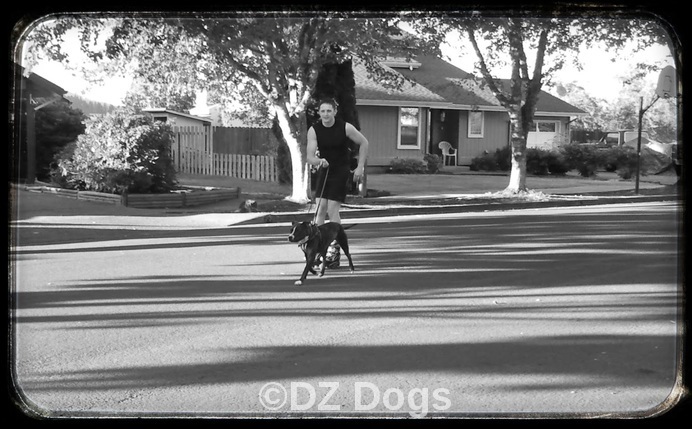 For example - my hubby does "Urban Joring" with Dante, this is where Dante using a very specifically designed harness, pulls hubby on roller blades. By running on the pavement he wears down his own nails, and they stay pretty short. "Mush!!" Dante loves to jore! When doing a dog's nails many people use clippers. Their are many different styles of clippers but they need to be sharp to do a good job. If you choose to use a clipper when you cut nails, then you should pick up "Quick Stop" to help quickly stop the bleeding (hence the name) if you accidentally hit the quick. When we had Tex-Anna, it took some time but she eventually got to the point where it was super easy to cut her nails, and we were quick at it. It helped in her case that she had white nails and we could clearly see the quick. Dante also has nails that are easy to cut with clippers. Another option is to use a dremel to essentially shave down the nail. How Often Do You Trim Down Their Nails? According to Dr. Leslie, the initial trimming down period takes the longest and should be done about every 2 weeks. 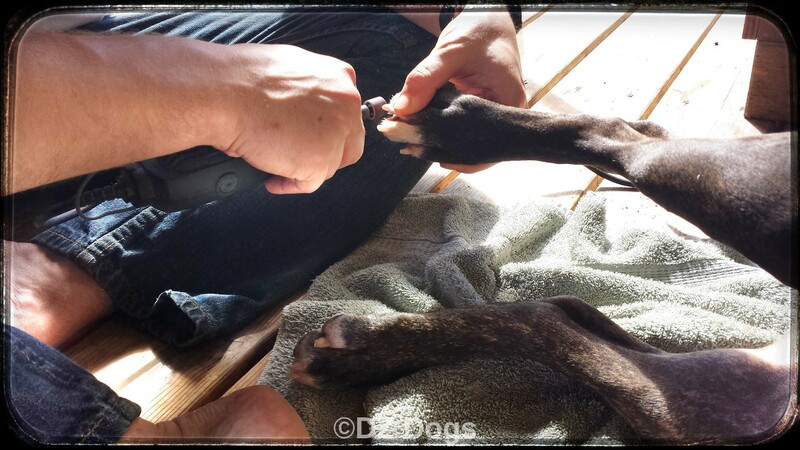 As you shave/clip your dogs nails the goal is to get the quick to recede over time. Every time you groom your dog's feet you should be getting as close to the quick as possible without actually hitting it. As for ideal length? Ideally your dog's nails should be short enough that if they were to walk on a hardwood floor, you would not hear any clicking. 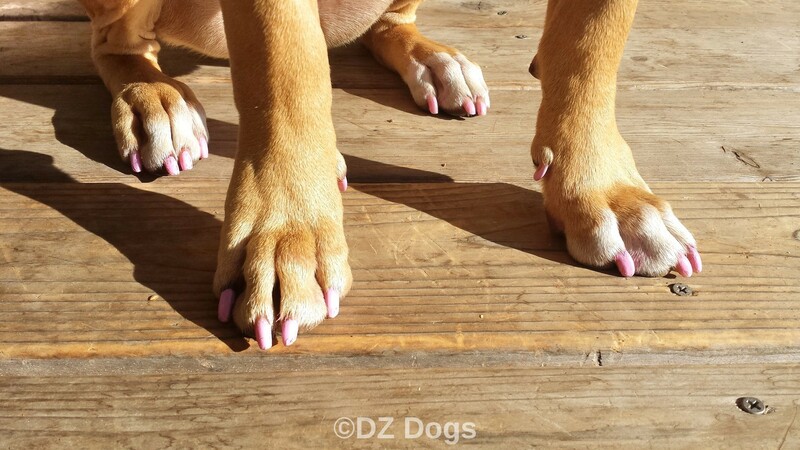 Once your pup's nails are short then they are easy to maintain, and you can trim them about once a month. -Dremels become hot if you leave it sitting on the nail for too long. Take you time and do quick swipes as you file their nails, careful to not sit on one spot for too long. 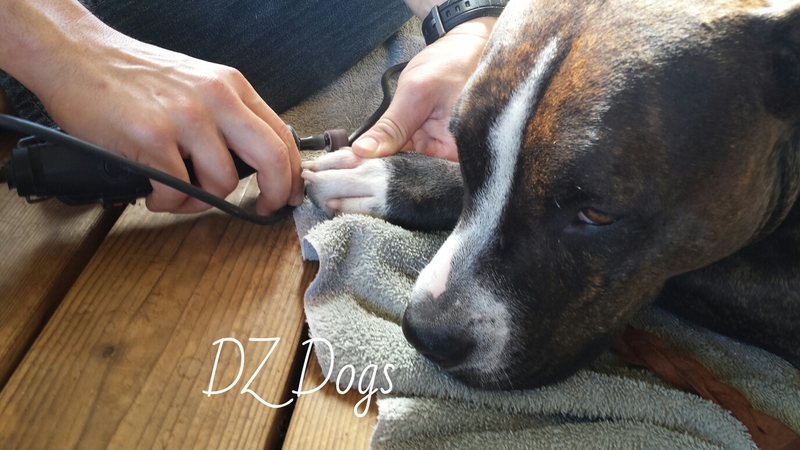 -A bad angle can cause the dremel to "jump" or "chatter" this won't hurt your dog but may make them nervous. -Do not hit the pads on their feet, their skin, or hair - it'll hurt! -If your dog has long hair - trim the hair around their toes so that you don't catch it in the dremel. We started using a dremel because not only does Ziva have very dark nails, but she would also panic when we tried to clip her nails. Short of sedating her it was too stressful and required us to "man-handle" her which was unsafe because she struggled, panicked once again, and we were worried about cutting her quick. Unfortunately for her, we needed to shorten her nails. So we looked for more solutions. We tried treats to no avail, calming herbal pills, catching her when she was napping, exercising her hard so that she was tired first...it just wasn't working without causing her tons of stress and making us feel like terrible parents. So we began to use nail files to slowly work her length down. Merlot helping Daddy with the file, while Dante offered his emotional support. We learned you can use a dremel! Many people prefer a dremel to clippers because their is less risk of clipping the quick, the dremel although noisy, is also a constant noise as opposed to the sound of clippers which in Ziva's case she was anticipating with fear. Just to be clear. Introducing the dremel was no easy task! It took patience and perseverance. 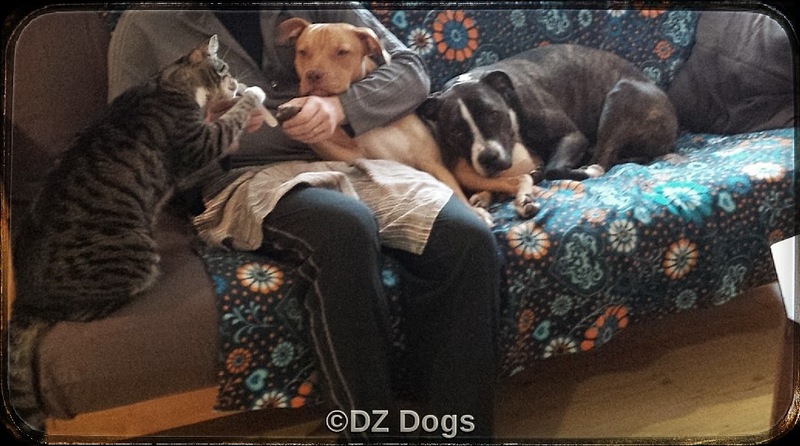 Dante whose trust we have 100% we started with. Dante's paws. See the white tips? Those gotta go! 1. Set up your station - in our case a towel for him to lay on, dremel, and hand nail file. 2. 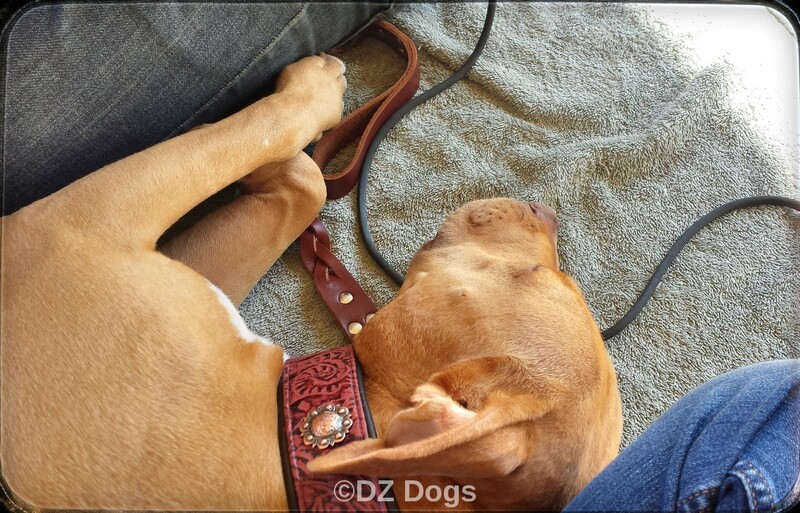 Leash Dante - asked him to lay down, business as usual maintaining a calm demeanor and rewarding him for calm behavior. 3. Show Dante the dremel (with it off) - let him sniff it, give him a treat for good behavior. 5. Start working on his feet. He handled it very well! Just laying their calmly the whole time. I didn't need any help and was able to get through all his toes in about 10 min. Using the dremel - we file in the order of: Under, side, side, top, and then round out any sharp edges. The dew claw can be kind of tricky to reach: using your non dremel hand hold it away from the paw and then shave it. You want to get as close to the quick as you can, without hitting it. Dante napping while daddy dremeled his back nails. 6. Lots of treats and praise when done. 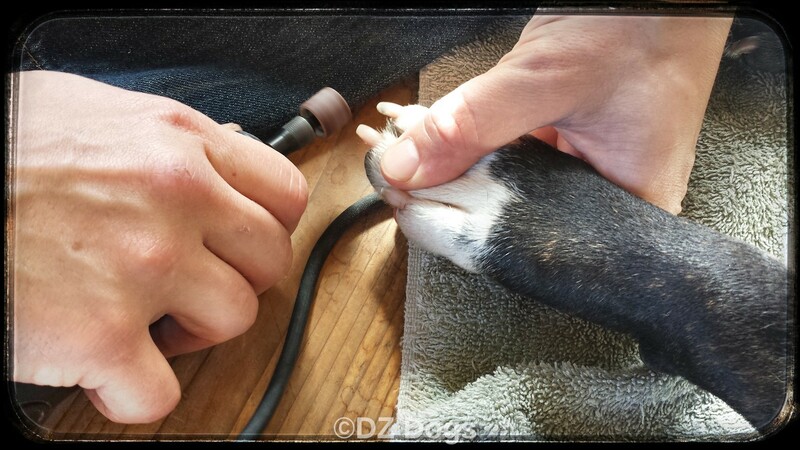 When we dremel our dogs feet, we find that it is easiest to ask the dog to lay down on their tummy and work our way around their body. Dante seems to prefer to lay on his side and take a nap, this makes for an odd angle on your part, but i'm not going to argue with a dog who is giving me complete compliance! Ziva - took a little bit more time, lots more treats, and two people. With Ziva, daddy held her in his arms while I worked on her feet. - If your dog is anxious, take your time, give lots of rewards and be calm. Any anxiety on your behalf will make your dog more anxious. - If your pups is starting to become overwhelmed, or you are feeling frusterated - take a break. - It took us almost an hour the first time we used a dremel on Ziva's toes. We took lots of breaks, which involved walking her around (on leash) and then asking her to lay down again, giving her treats for calm behavior, and telling her she was a "good girl". - If your dog is becoming panicked - don't tell him/her that she is a "good girl", if you do then you are rewarding her anxious behavior. Instead; try to see your dogs' individual signs that they are becoming panicked. If you see panic building up then stop. Take a break, walk around, and reward calm behavior once again. Panic will destroy the trust you have built with your dog. - If your dog is being calm while laying down - offer praise/rewards. 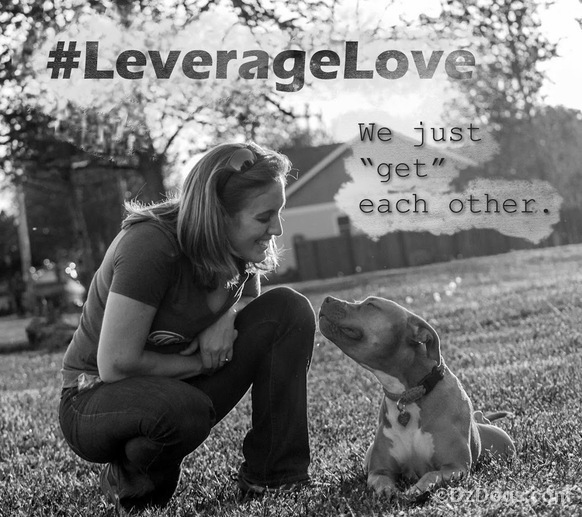 - If your dog is being calm: not struggling while you hold their feet - offer praise/rewards. 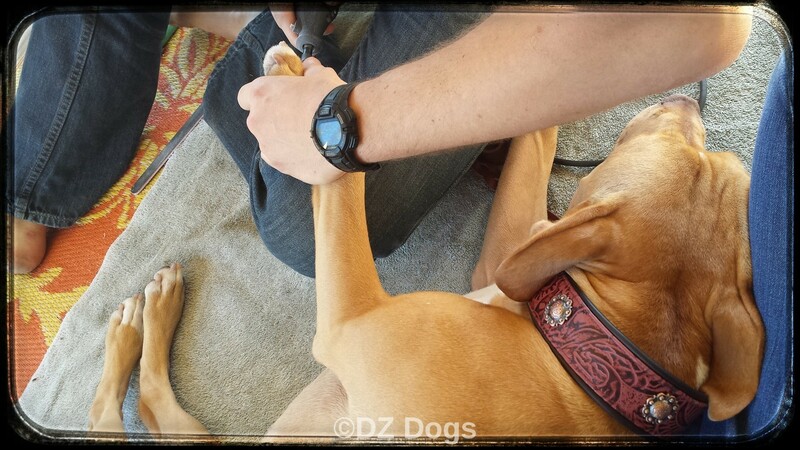 - If your dog is allowing you to dremel their feet - offer praise/rewards. However do not reward/praise to your pup if they are struggling. It's also important that you be the one who calls the breaks, and that you finish their toes. If you stop every time your pups struggles, then you are teaching them that the behavior of struggling = dremel monster goes away. Ziva struggles to show she is uncomfortable, and a bit anxious. This is different from her panicking which is something we want to avoid. 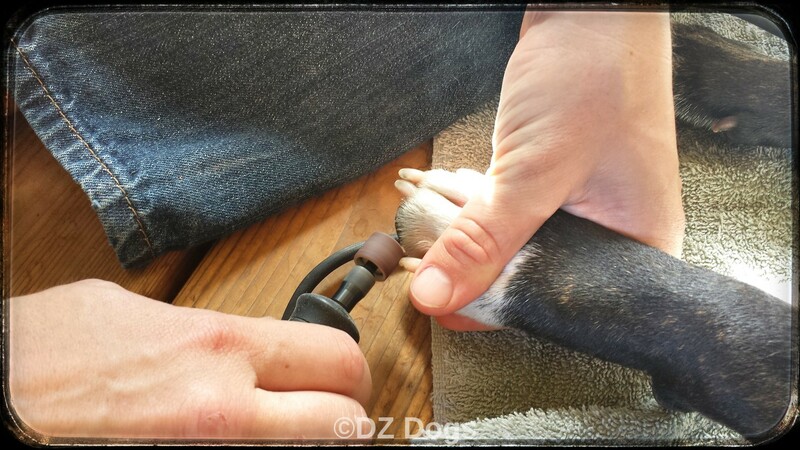 In a situation such as this - Your pup is struggling: take the dremel off of their toe, however leave the dremel on. We found that massaging Ziva's shoulder joints and legs helped her to relax her feet, then take hold of the foot, and once she is not struggling, begin filing again. 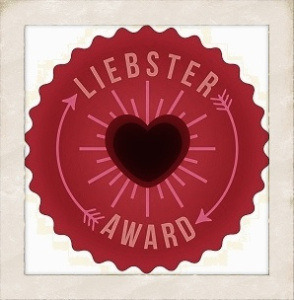 Constantly praising good behavior. With Ziva the third time with the dremel was a charm! On our third dremel session, it only took us about 15 min to do Ziva's nails. We asked her to lay down, and her calm behavior meant that she was rewarded with treats and praise. *Click, Treat. *Click, Treat. I spaced out my clicks/treats so that she was being rewarded for holding still for longer periods of time. As you can see, she had her leash on but we didn't need to hold it. It still took two people, dad to dremel, mom to offer rewards for good behavior. If she started to get up, we would "reset": have her lay back down, reward: *Click, Treat. Way to go Ziva!! Almost done! She is still a bit nervous - see the wrinkles in her forehead? But she's much more trusting of us & the process. Ta da! She still has long quicks/nails, but they have become much shorter compared to how they used to be! 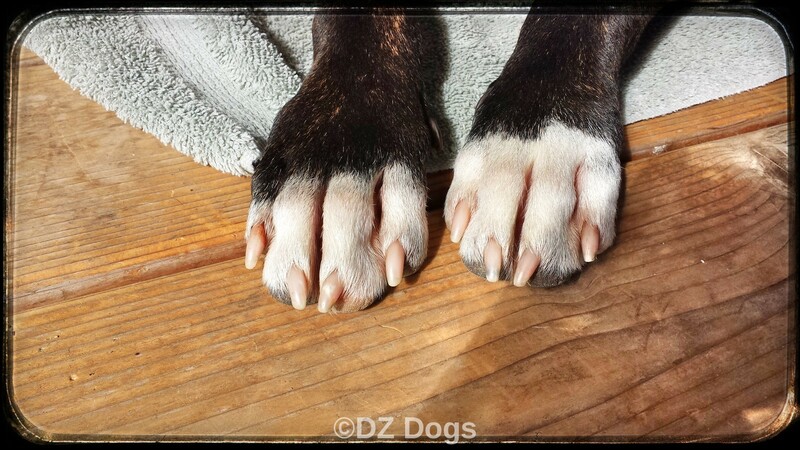 What Type of Paws Does your Dog Have? Dante and Ziva both have cat paws!! This post is part of the Adventure Dog blog hop, hosted by DOGthusiast and Tiffany's Diamond Dogs every Tuesday. What a fantastic overview! We had some extreme anxiety with Mort right out of the shelter (so if the fear is instilled too young it's possible I'd never be successful in desensitizing him)... and of course nails too hard to file down naturally... his paw pads file down faster than his nails!! I took nearly a year at trying to desensitize him to both clippers and then the Dremel (he immediately made the same association as soon as he linked the dremel to his nails). Anxiety to the point of nearly biting us, insanely bad vet experiences, and instant zero to 10 on how quick he'd get beyond threshold. So I ended up training him to file his own nails, and he not only tolerates it he loves it. 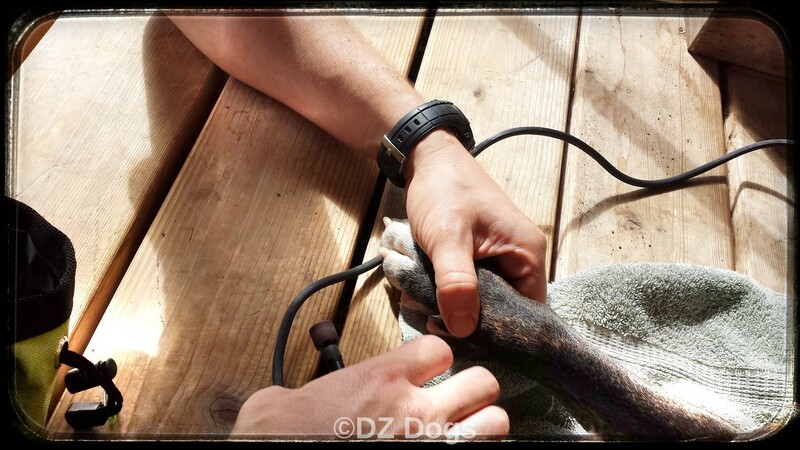 Not as good as a dremel because of that uneven thing, but it gets the main job done for safety/alignment and the rest he bites off himself (again, not ideal but way worse than regular stress, keeping the vet in such a negative mindspace, or being bit), steps we took are here http://dogthusiast.com/2014/01/06/training-tips-tuesday-dog-scared-of-nail-trims-file-instead/. Bummer about Mort, thankfully Ziva has never panicked to the point of biting. Initially she didn't want anyone to even touch her toes, so we began handling them regularly like during movies on the couch and such, and then we began to paint her toe nails to show her that bad things didn't always come of having to sit still and have her feet be handled. Great! We've never ever trimmed Barry's nails. His have always stayed pretty short because of all of the walking we do and it's almost always on cement sidewalks. Even during the winter his nails stayed pretty short. I'll keep a good eye on them this year but I'll be prepared if we need to (thanks to this!). Also, luckily for us, Barry is calm and cool and doesn't care if we touch his toes. I bet trimming or filing his nails won't be too bad when the time comes. Great post! A lot of people overlook doing their dog's nails!! Laika sounds a lot like Ziva, it did take an hour yesterday to get her front nails done, BUT it was the first time using a dremel so I'm quite pleased. She really hates her back paws being messed with though, so that will be another day's challenge. I'm glad I read this because there's a few extra suggestions I'm going to try the next time we do the dremel. I have no idea why I used a guillotine one for so long; I guess it just seemed normal. It really was just causing so much more anxiety for my dog. So glad we could help! 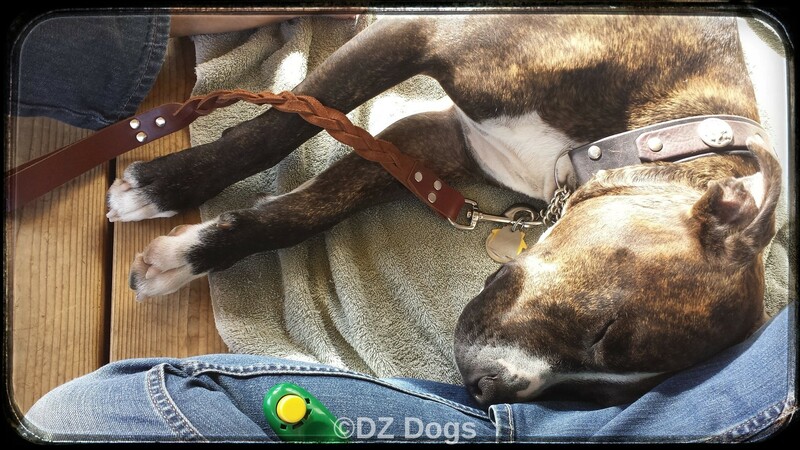 :-) The dremel has helped us significantly with Ziva, good luck with Laika! A google search or even youtube veterinarian channels are good sources, lots of positive pet bloggers talk about how they do their dog nails. 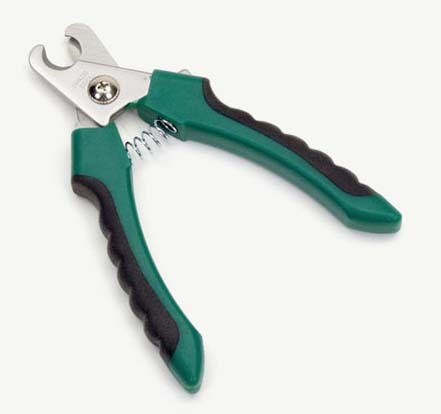 I would try searching "positive training dog nail clippers" to find something else. Or you can email me your question directly and I can try to help you further.